A beautiful travel journal is one of the first things to pack for your trip abroad. Hahnemühle sent me some journals and watercolor papers to try. Just for fun they included extras for me to share with my readers! You can enter the drawing below. Best of luck! One of the things I love about this travel journal, is the pocket in the back. This is a great place to tuck ticket stubs, ephemera and other notes that might not make it to the pages of your journal. 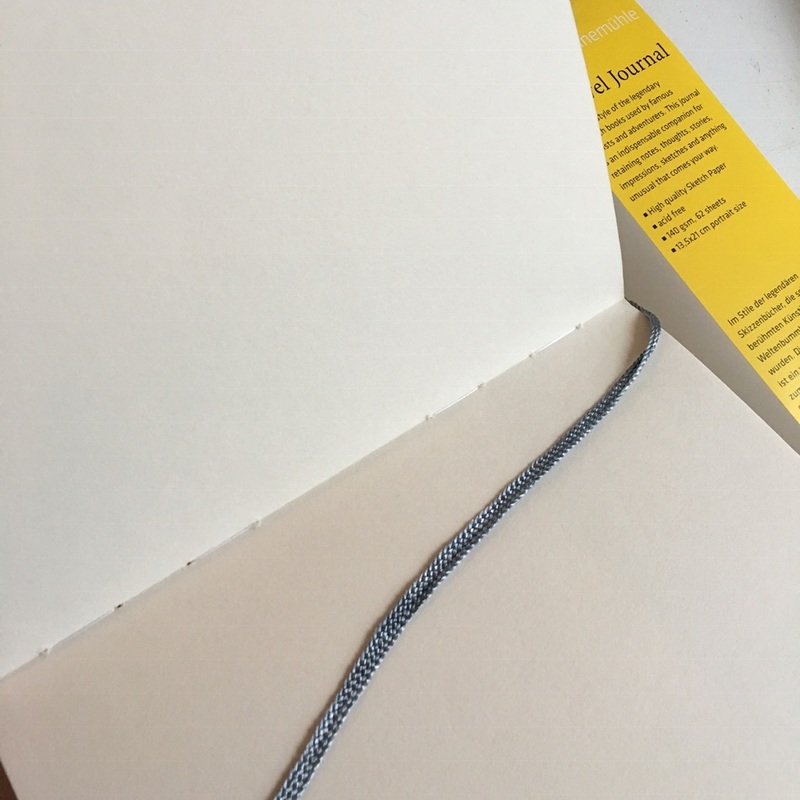 There is a sturdy elastic strap to keep the journal closed when it’s not in use, too. Best of all, the paper in this fine art book is nice and thick, so it accepts watercolor washes in addition to pen, pencil, colored pencil, collage, and more. 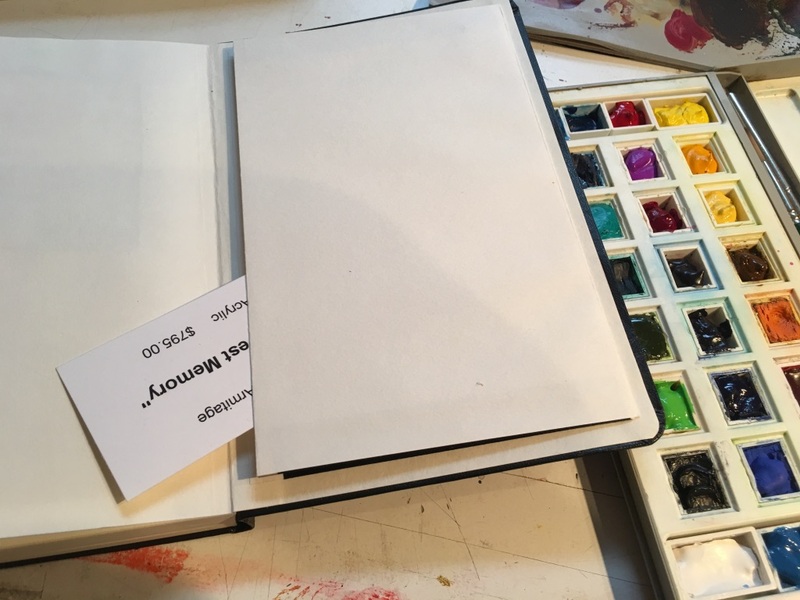 In the first photo below, you can see that the page has a slight ripple from accepting the wash, but it wasn’t significant enough to impact the wash.
Why do artists NEED to travel? 1. Inspiration: Painting alone in your studio can leave you feeling like you’re in a rut – devoid of new ideas. Traveling takes us out of our ‘norm’ and introduces us to natural beauty, new cultures and people. 2. Time to Create: Traveling with fellow artists leaves more time to create. When we travel with friends or family, they are often impatient to move on once they’ve seen a sight. Painting trips have time built in to really focus on capturing that moment in time through sketching and painting. 3. Perspective: Time spent creating helps us to understand a culture more deeply, to immerse ourselves in the place. It also helps us see a broader picture of our place in the world. 4. Stories to Tell: Inevitably travel leads to adventure. Exploring narrow alleys, trying new foods, seeing different landscapes, art and architecture all contribute to content for our artwork. On this trip to France, we will be immersing ourselves in color study. Light and atmosphere all contribute to our sense of color, so painting in a new location hones our color sense. 5. Knowledge: Reading about a place and seeing it in person are very different. There is no substitute for the combination of sights, sounds, smells and textures you experience in a place you’ve never been. Local customs, language, food, dress – it all combines to create a fuller understanding of place. Leave me a comment: What’s the first thing you’d pack for a trip like #ColorsofFrance? 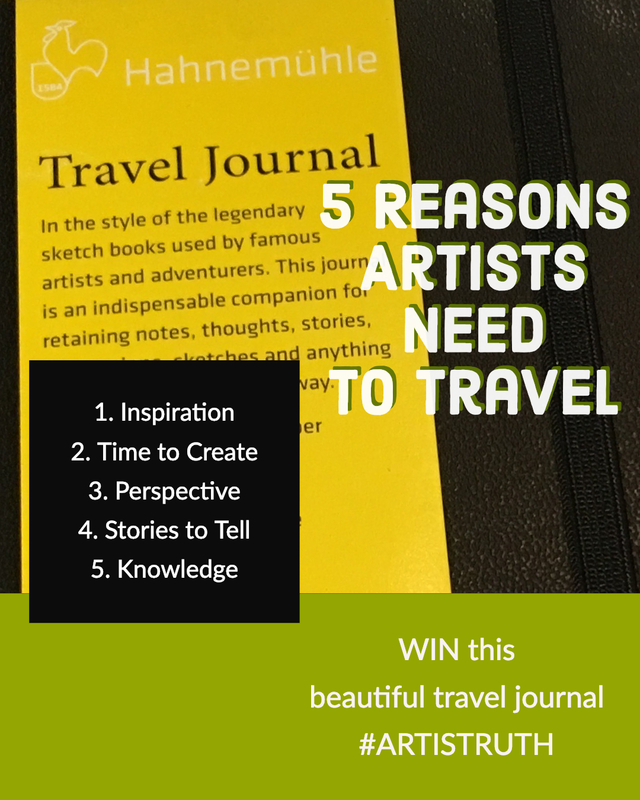 And don’t forget to enter below to win your own Hahnemühle Travel Journal. Disclaimer: Hahnemühle provided the travel journal for the purposes of my review and an extra journal for this giveaway. I received no other compensation. Thanks for their generosity! Hi Ruth! Wow! So neat that Hahnemüler sent you the journals. 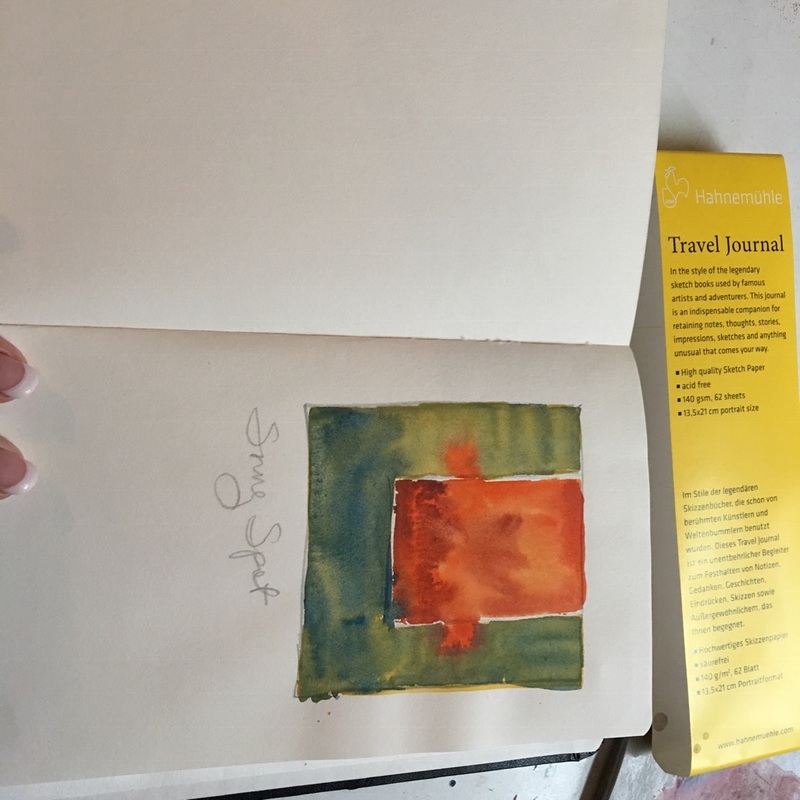 When getting ready for a trip, Watercolor journals are the first thing I look for to make sure I have enough paper for the trip. Then I make sure my palette is loaded up with fresh paint. Add pencils and brushes and we are good to go! Oh, and water. Your trip to France sounds exciting! Thanks Peggy 🙂 Maybe you can come along!? Hi Ruth, I would love to, but traveling overseas isn’t in the proverbial cards this year. I am so intrigued, though. Have you read the Martin Walker novels? They are set in just the region you’re going to! He talks about Perigord, the Dordogne, food, wine and the beauty of the region. You ought to have such a great time! My future daughter-in-law gave me Bruno, Chief if Police for Christmas and I just finished it. I am thinking of picking up another one! It is really whetting my appetite for the trip! The first thing I’d pack is my little travel watercolor set! The Travel Journal would be the perfect match for my watercolors:) Wish I could go to France! Thank you Rachel – maybe another time? My art supplies, of course. ? great article Ruth! Would be great for France! Thanks for your generosity, Carol! First I need to find my lightweight rolling suitcase to get a realistic idea of the perimeters/volume of what will actually fit! Great tip, Kara! Luggage restrictions can be tight, and packing light is crucial. Thanks Cindy! I haven’t tried the Dynasty quills. I’ll have to give them a shot! Hi Ruth, the first thing I’d pack is enough underwear to see me completely through the trip – no washing underwear just brushes on my trip. No art supplies you say? Actually, yes I would but since I never leave home, ever, without my very basic sketching/watercolors kit (always in my handbag) I know l am always ready to go! By the way still loving you techniques from the Lubbock workshop last year. Thank you, Christine! You’re prepared for anything! Loved hearing from you and knowing you’re still inspired by our workshop together. Watercolours , brushes, pencils and paper oh and waterpot.ie the essentials for life. Thanks Deborah – I think so too! I suppose the first thing I would pack is my CPAP machine, so that I get a good night’s sleep when traveling. After that I’ would have my art bag. Both those go on the airplane with me! I would love to visit France with you, but my finances do not allow it this year. Maybe in the future. I think that travel journal looks great! I do not see how to enter to win it. I am going to visit ghost towns in eastern and southeastern Oregon this summer, with a non-artist friend who is very forgiving when I take lots of photos! I really enjoy your communications. Thanks Kate! To enter, click the ‘visit Ruth Armitage Studios on Facebook’ button on the right side of the post – you can earn extra entries by commenting on the post, etc. Best of luck!